APPEARANCE: Isogashi is a blue-skinned monster with floppy ears, a big nose, and a massive tongue which flops out from its mouth. It runs about frantically, as if it had a million things that it needs to do. It is a type of tsukimono, a class of yōkai which possess humans. INTERACTIONS: Humans possessed by isogashi become extremely restless and unable to relax. They constantly move about, doing things. However, this is not an unpleasant feeling. On the contrary, people possessed by isogashi feel a sense of security in getting things done. Sitting around and doing nothing at all makes them feel as if they are doing something wrong. 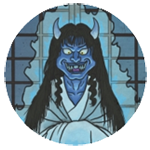 ORIGIN: Isogashi first appears in the Muromachi Period Hyakki yagyō emaki picture scroll, in which it is presented without any name. This painting actually spawned two different yōkai. During the Edo Period, the monster was copied into a hyakki yagyō picture scroll with the name isogashi written beside it. No other description was given besides the name. 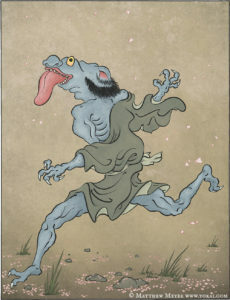 Around the same time, Toriyama Sekien attempted to give the nameless yōkai from the original Hyakki yagyō emaki illustration a name and an identity. He included it in his collection of tsukumogami Hyakki tsurezure bukuro, dubbing it tenjōname. Later, this yōkai appeared in a number of other picture scrolls, with the name isogashi appearing next to it. Despite being based on the same picture, tenjōname and isogashi developed into separate yōkai. Aside from paintings, nothing but a name was recorded for isogashi until the Shōwa Period. It does not appear in folklore or legends. 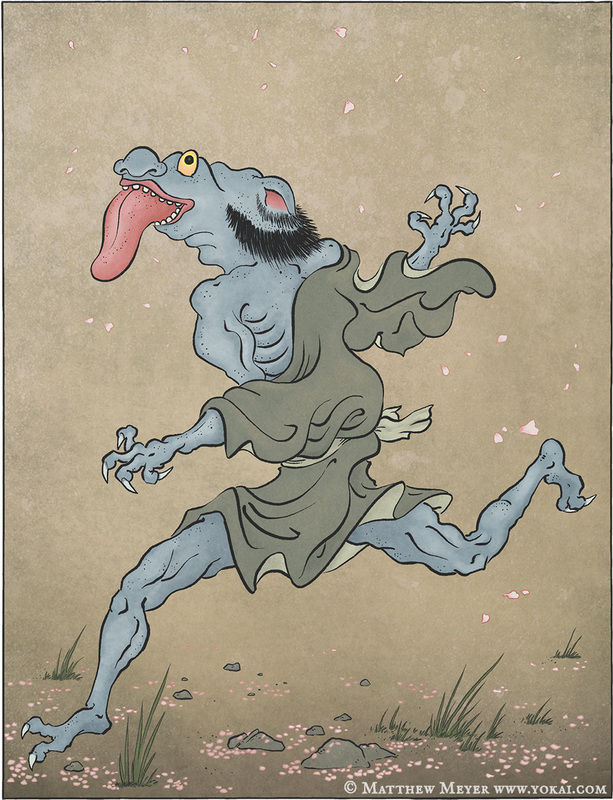 Mizuki Shigeru came up with the description of this yōkai as a spirit which possesses humans, and his description stuck.